The Waimea Ocean Film Festival (Ocean Film) returns to Waimea and the Kohala Coast January 2 to 10, 2014. 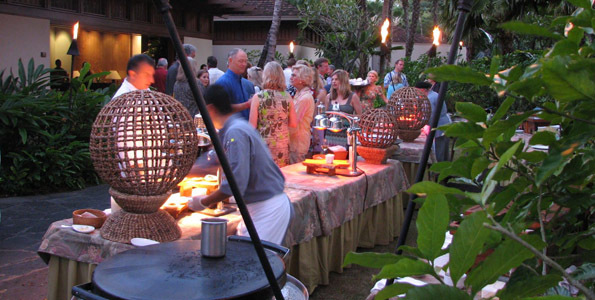 Enjoy films and programs showing in Waimea, the Mauna Kea Beach Hotel and The Fairmont Orchid January 2 to 10, 2014, and at the Four Seasons Resort Hualalai January 6 to 10. The combination of exceptional and award-winning films, intimate breakfast talks, Q&A filmmaker sessions, compelling speakers, artistic exhibits and receptions is not to be missed. In its fourth year, Ocean Film also offers a culinary event, Taste of the Island, and early morning activities, such as yoga on the beach. Through thought-provoking films and discussion, the festival immerses participants in a greater understanding and awareness of the ocean, culture and self. Informative Q&A sessions after many films offer viewers the opportunity to delve deeper into the film’s message and production while posing questions to filmmakers. Last year’s festival offered more than 60 Q&As and a dozen casual breakfast talks with filmmakers and experts associated with film topics. Festival passes will go on sale in September, along with early bird rates designed for kama‘aina. « ‘Ulu Ocean Grill and Sushi Lounge one of top 100!